If you loved The Thin Man or Mr. and Mrs. North, you’ll adore the smart detectives in SIX DAYS IN JUNE. Harrison Hunt is arch. He’s a wag. He’s an authority on Shakespeare, and he’s not afraid to use it! Poor Harrison Hunt. As usual, like in the earlier Brookfield Murder case, he’s a magnet for mayhem. In between garnering Tony nominations and mounting new plays on London’s West End, our intrepid Broadway curmudgeon gets himself entangled in yet another murder investigation in quaint Havenport, spouting Shakespeare both aloud and to himself as he goes. Much of the fun is the old American seaside setting, a harmless enough little village hiding dangerous secrets (and secret passages)! Why would anyone want to kill poor, benign Tom? What has happened to Sally? Can the killer really be one of those nice locals who make up Miss Annabelle Laurence’s Little Players? Why does Sophie often have the uncanny feeling they’re being observed…yet sees no one? Surviving even a nasty blow on the head and reliving the trauma of nearly drowning as a child, Harrison Hunt does not merely prevail over the unexpected evildoers: he (and justice) triumphs! Very highly recommended. Delightful tale of murder and other assorted kinds of mayhem. Harrison Hunt is your man if you like your crime capers laced with allusions to Shakespeare and to Broadway musicals. The solution to the question ‘who dunnit’ was a complete surprise. I read the first Harrison Hunt mystery, Five Days in May, and I liked it. But this one, Six Days in June, is even better. The characters, especially Harrison Hunt and Sophie, his assistant & sidekick, are better developed in this second book and I look forward to their future endeavors. The story takes place in a beautiful and rather isolated locale that lends itself well to a murder mystery. Six days? No way. 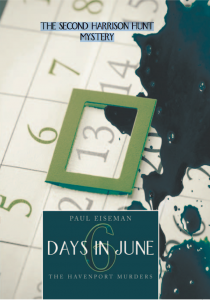 It will take only one day to read Paul Eiseman’s 6 DAYS IN JUNE. Why?? It is engaging and well-written……especially for those who appreciate Shakespeare and other literary allusions, the theatre world, relationships, crime solving and the always inviting shocking ending. Eagerly awaiting his next mystery. This was really a fun read. Eiseman is able to integrate setting, complicated plotting, character and theme which to me is essential for a good mystery. Harrison Hunt, theatre director, Shakepearean scholar and impossibly demanding boss, lets us in on the theatre world from the inside out. His assistant Sophie is resolute, intrepid and generous to a fault, besides being Watson to her boss. She balances the self absorbed Harrison and keeps him on track. What’s next? Can’t wait. My book club will love this series. 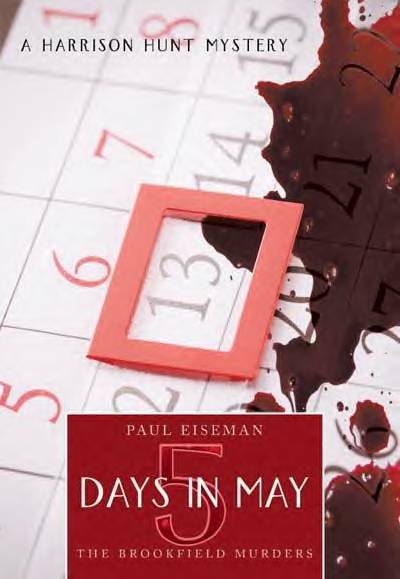 Paul Eiseman’s FIVE DAYS IN MAY: THE BROOKFIELD MURDERS is a breath of fresh air — and a touch of the dramatic — when it comes to mystery novels. Eiseman knows theatre inside and out so the story has that authentic backstage feel. FIVE DAYS IN MAY will remind you of those wonderful old films they don’t make anymore. If Eiseman didn’t just invent Harrison Hunt, the charmingly egocentric stage director, you’d swear he’d been sleuthing around for years. Eiseman’s characters spring off the page and animate themselves as you devour each cliff hanging chapter. Once you finish Eiseman’s first collaboration with Harrison Hunt, you can’t wait for him to get in more trouble. Harrison Hunt never dreamed his summer directing theatre in a small town would wind up like this. But alas, his idyllic world of actors, sets, costumes, and props is shattered when his good friend is found dead. While the police and coroner believe it to be an accidental death, Hunt feels there’s more to the tale than what’s on the surface. 5 Days in May: The Brookfield Murders is a gripping and exciting whodunit from first page to last. Author Paul Eiseman weaves an intricate tapestry of suspects, red herrings, clues, and mystery that will keep you guessing until the last possible moment. The main character, Harrison Hunt, is not Sherlock Holmes by any means. But this makes him all the more appealing as the lead investigator delving into the mysterious and illusive truth behind his friend’s demise. Helped by his assistant, Sophie, Hunt works diligently to uncover the truth all the while attempting to maintain his directorial obligations for the summer. Eiseman is currently working on the second novel in the Harrison Hunt series, and if this first outing is any indication, the next one will surely be just as gratifying. I highly recommend 5 Days in May: The Brookfield Murders. It’s a solid murder-mystery story that you’ll not want to put down. Like the best of British suspense or stylish movie mysteries from the Thirties & Forties, this story looks into the darkness lurking behind the most ordinary, otherwise cheerful circumstances. In this case, pretty, tree-lined Brookfield plays host to a series of disturbing demises. Figuring out Whodunnit is bristly theatre maven Harrison Hunt, in town to cast & direct a stage play but, instead, forced by circumstance into finding a killer. If you’re up on show biz/theatre trivia, you might find yourself catching the killer before Harrison Hunt does. Then again, even with the clues right before your eyes, you’ll probably be as surprised as I was when everything came clear in the tense, final pages. This is the first Harrison Hunt mystery; I for one look forward to the next. I’m pretty good at figuring out mysteries….not this time! FIVE DAYS IN MAY: THE BROOKFIELD MURDERS is a book I’ll want to read over and over again. I COULD NOT put this book down! The characters are real and interesting, the plot is always turning, and the added bonus of getting a behind-the-scenes view of the theatre world is a delight! A MUST for any theatre or mystery fan! This cleverly plotted and well-written mystery is a delight to read and tough to put down. The plot weaves and winds, keeping you guessing. The characters are fun and well defined and there is a lighthearted component to the work. I loved it! When does Harrison Hunt again? Expertly crafted and totally engaging This is a fabulous read! Finely crafted with fast pace and clever plotting. So much happens in just 5 days! Characters are introduced well and come alive. The plot is tight and surprising. An excellent read! Bring on a whole new series! Stately plump, Harrison Hunt enters into a town where murder is as common as literary references high and low sprinkled surreptitiously. People are taken out one after another and each one is unexpected and strangely hilarious. And who knew there were so many delightful ways to die? You will hone your sleuth skills while brushing up on your Shakespeare in this yarn. Scared? You bet. I feared that I might miss the next double entendre! Smart? A phd arrived with this volume. Clever? It was so clever, I read it three times and each time was surprised by the ending! Funny? Multiple murders, I ask you! Seriously it was a treat and very highly recommended.